You are cordially invited to discuss emerging trends, challenges, and market impacts with fellow C-Level decision-makers at SWS’ exclusive, executive dinner. Digital Disruption is real. Per IDC, all of this incredible change puts technology at the core of every business, in every industry, in every country across the world. We do live in exciting times, where technology has democratized the playing field and reduced the barriers of entry for many companies looking to build new and innovative solutions to service today’s digitally enabled customer base. When you think about the last 15 years, our industry has evolved and is evolving at a rapid pace. Digital disruption isn’t going away and IDC predicts that approximately another 33% of industry leaders will be further disrupted by digital transformation before the end of 2018. However – the digital opportunity is real for those that can navigate this transition. How can you accelerate digital transformation in your business? By 2020, IDC predicts IT infrastructure spending on the cloud will eclipse that of traditional data centers. End-to-end cybersecurity solutions will be critical as the technological landscape continues to evolve. How can we build innovative and industry leading solutions with OEM & IoT? The need for real business data analytics, linked to predictive analytics, will drive new strategic outcomes. 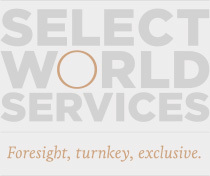 JOIN US for senior-level conversations, exchange of ideas and networking at Select World Services’ exclusive, by invitation only Executive Dinner – Digital Transformation: Turning Digital Disruption into an Opportunity.